Author Written by Yogesh and last updated on Posted on May 9, 2017 . 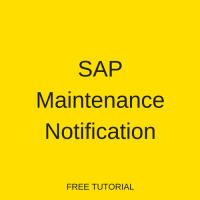 This tutorial is part of our SAP PM course and it talks about SAP maintenance notification, its processing and required configuration. 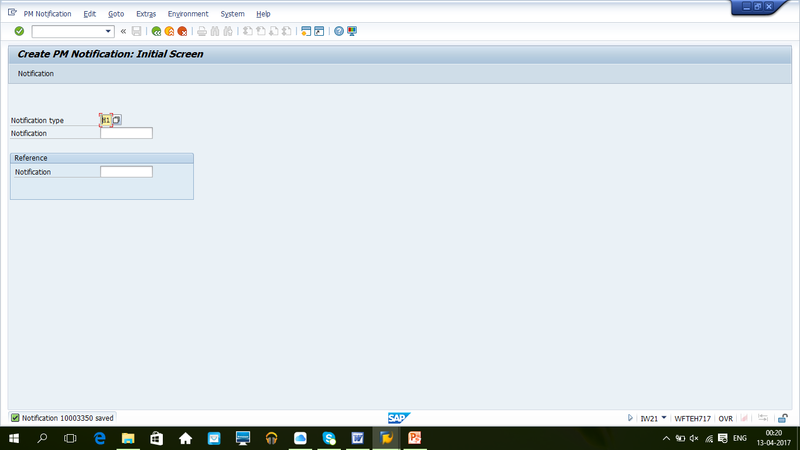 You will learn how to create SAP PM notification, its processing cycle, different statuses and further processing. Our explanation will be illustrated by examples for notification creation, processing and closure. 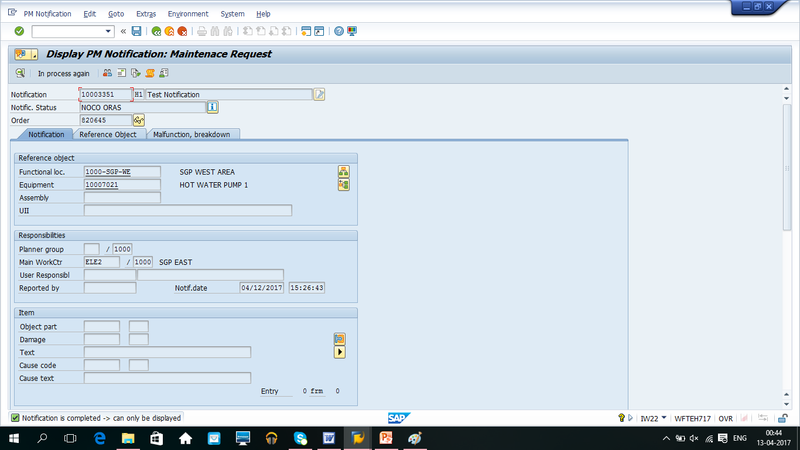 SAP maintenance notification plays an important role in SAP Plant Maintenance. It is used to notify maintenance department about an abnormal or exceptional situation(s) in technical objects at the plant. It is also used for planned maintenance activity and to notify planners. Tasks can be defined in notifications, which can be used for reporting and analysis. You can use notifications for preliminary planning or as a request for maintenance. A notification can only hold information and not any cost. The notification can also be used as a request for maintenance, before the order is created. Through different steps of processing, the notification will get a different status. 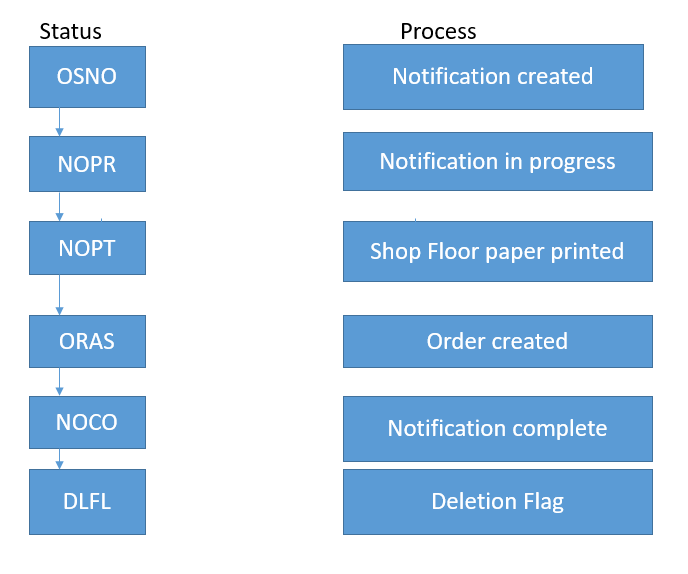 Each status represents a step in the notification lifecycle and different functions are related to the status. 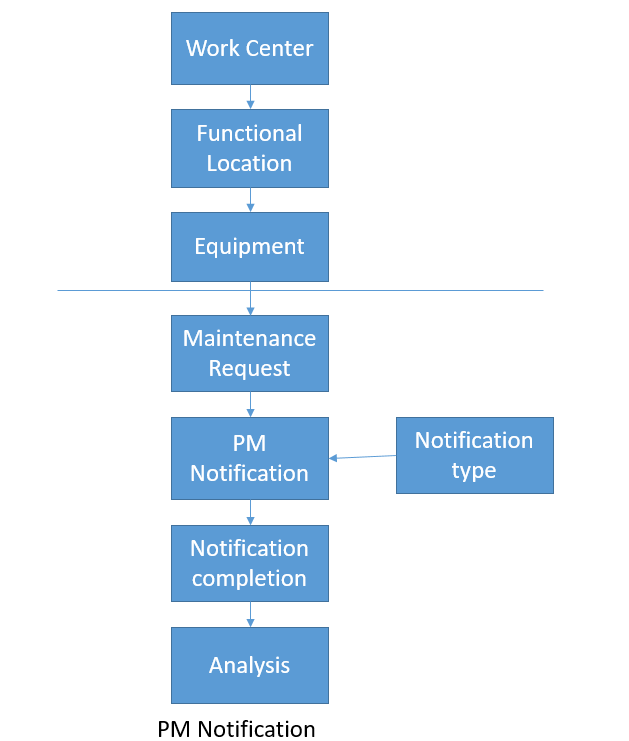 In the diagram below you will find the notification processes from the basic maintenance flow and the status is related to the process. On the right side, you can see each function available with the status. 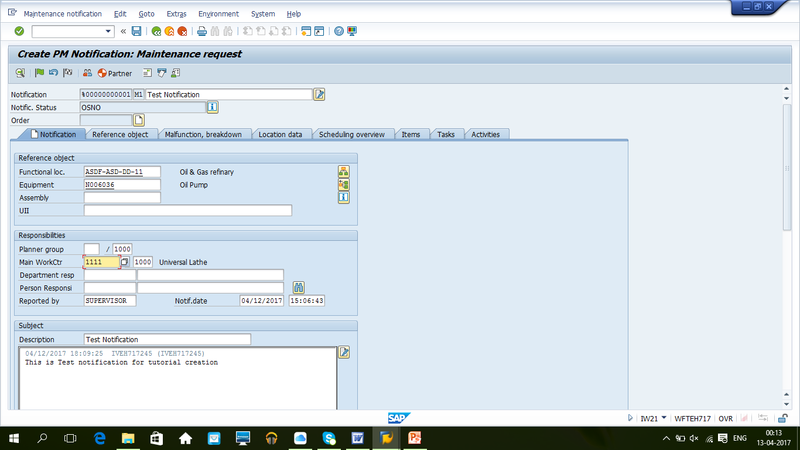 When you create SAP PM notification, it is very important that you choose the correct notification type, because almost all reporting are done by notification type. In reporting, you can compare various figures (e.g., reasons for particular failures, frequency of specific outages, etc). 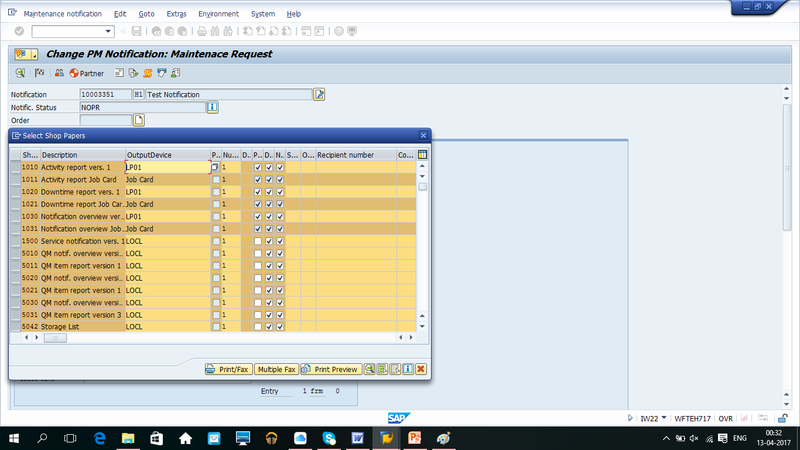 Manual creation of all types of SAP PM notification follows the same steps. In some PM order types, notification gets created in background. However, that is not defined in this tutorial. 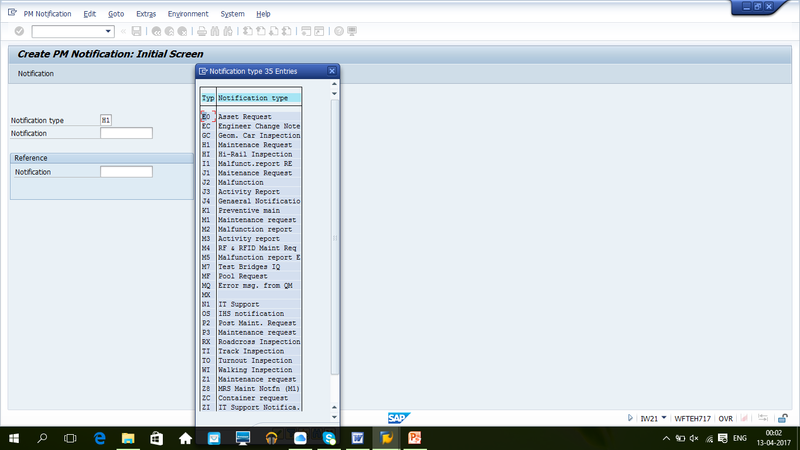 SAP maintenance notification contains a lot of information related to a maintenance request or breakdown. It is linked with equipment, which automatically takes data of functional location as well if connected hierarchically. Equipment is actually a machine or tool used for a production facility. Please refer to PM master data tutorials for more details on equipment and functional location. SAP maintenance notification header contains information needed for the identification and management of the maintenance notification. This data is valid for the complete maintenance notification, e.g. start of problem, breakdown details, equipment, functional location, etc. 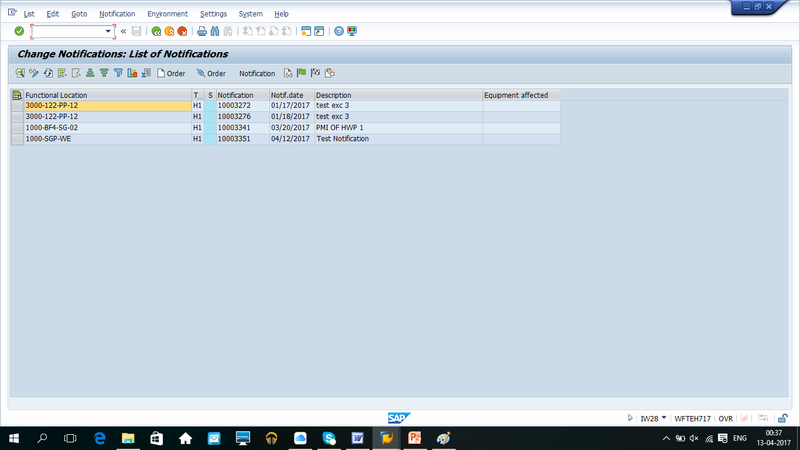 In a SAP notification item(s), you can enter and maintain data in order to determine details of a problem or the damage that has occurred. A notification can have several items. 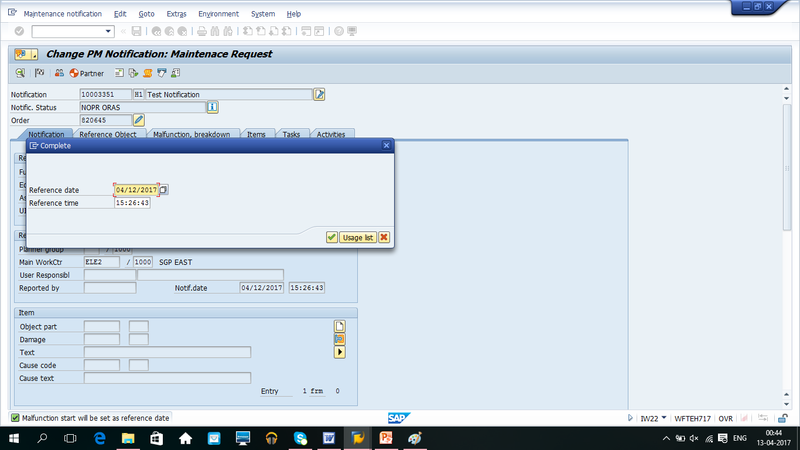 Activities in SAP maintenance notification document the tasks performed for this notification. They are particularly important in monitoring the progress of tasks and the notification. Tasks in a notification describe maintenance work which needs to be executed. The emphasis is on planning and organizing the work. It is also possible to create SAP maintenance notifications without a link to any object. For example, when the malfunction report refers to a technical object which is not maintained in the system or if maintenance requests refer to an object that is part of any product development. 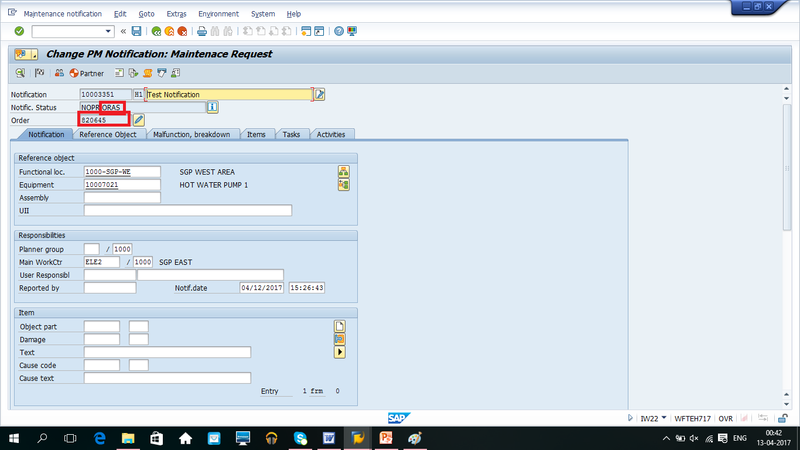 To create a new PM notification, start the transaction IW21. On the initial screen of this transaction, enter Notification type (you can choose from a dropdown using F4 button on the keyboard). It is also possible to use an existing notification as a reference. If you specify a reference notification, the new notification will copy information from the existing notification. Next, click Enter button on the keyboard to proceed. 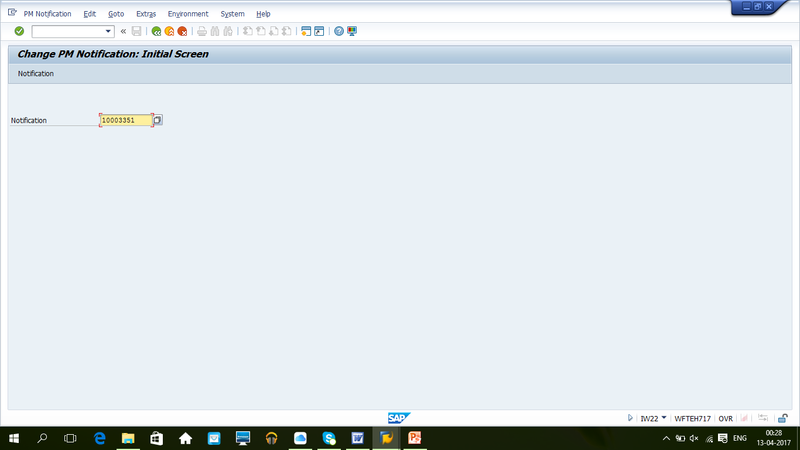 The SAP system will take you to the next screen. Scroll down to see more fields in the notification. 1. Make a short description of the problem (Short text). 2. It is also possible to define detailed problem statement in long text. 3. Functional location and Equipment can be provided for which maintenance is requested or having problem in case of breakdown notification. 5. Main WorkCtr is defaulted from equipment. 6. Breakdown checks needs to be selected if notification is related to a breakdown process. It will be defined in another tutorial related to breakdown maintenance. 7. Damage code, Cause of notification can be defined if known, else need to be put at the time of completion. It will be a basis of analysis and reporting in future. If maintenance tasks are known, they need to be defined in task tab. It is part of planning. Code groups related to tasks are defined as part of catalogs which needs to be created earlier. We will explain in more details about creating catalogs later in this tutorial. You can document activities performed during maintenance processing if notification is created from an order and as a result of breakdown process. Here, code groups and codes from catalogs are also used. Click on Save button once all required information is defined in the notification. 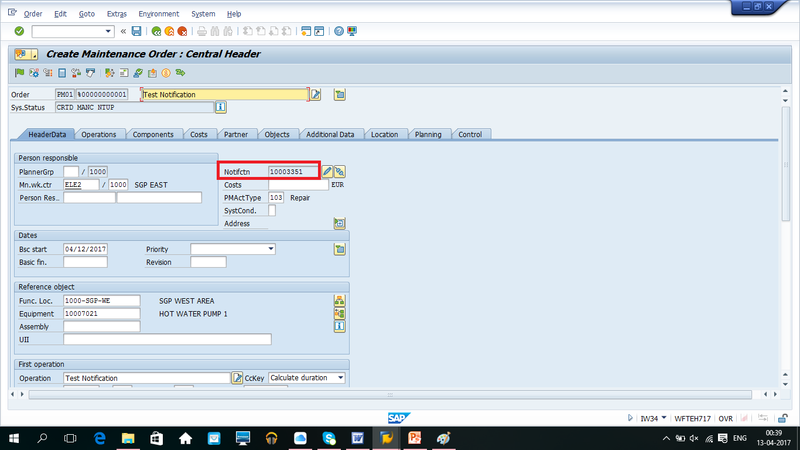 The SAP system will generate a number for our new notification from the internal number range which is defined in customizing. The initial status of a notification is called Outstanding notification – OSNO. Catalogs are configured in the transaction QS41. Catalogs are list of catchwords which are predefined for using at different business functions. 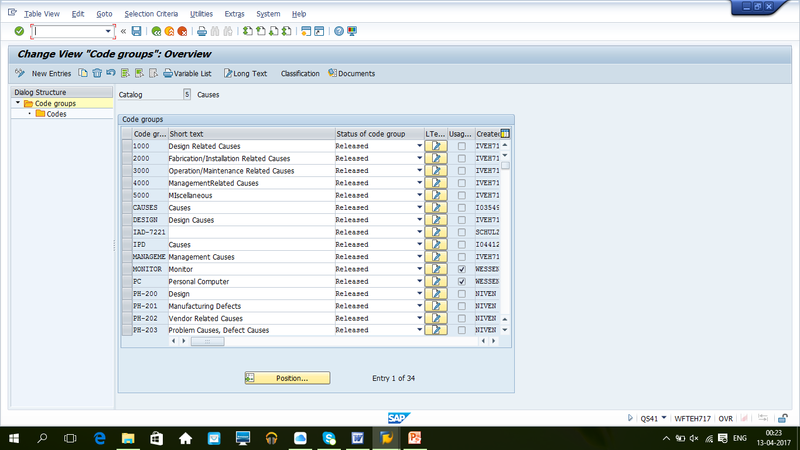 This part of SAP is used by QM module as well. A catalog contains code groups, codes and their respective descriptions. Codes can be selected in PM notifications, e.g damage and problem codes. For example, we can define a cause code as LEAK which can be linked with valve leakege as a cause of the breakdown. To change an existing notification, start the transaction IW22, input the notification number and then click Enter button to go to the next screen. This transaction is used when any changes are required in a notification before setting it to “In progress” status. The change mode can also be used to put notification in progress if not done during initial creation. The notification will be updated with the status NOPR. Click the Green flag to set notification to “In progress” state. It will change the notification status. It is usually done by a maintenance planner after reviewing the details of a PM notification. Shop floor papers are usually printed at notification release. You can print shop floor papers through the print menu which can be selected from the top menu bar as shown below. This transaction is used by planners. It will provide a list of open notification based on status, selection input, priority, etc. Once a planner has a list of notifications, they can be assigned to a group of responsible personnel or SAP PM order can also be created from a notification if required. 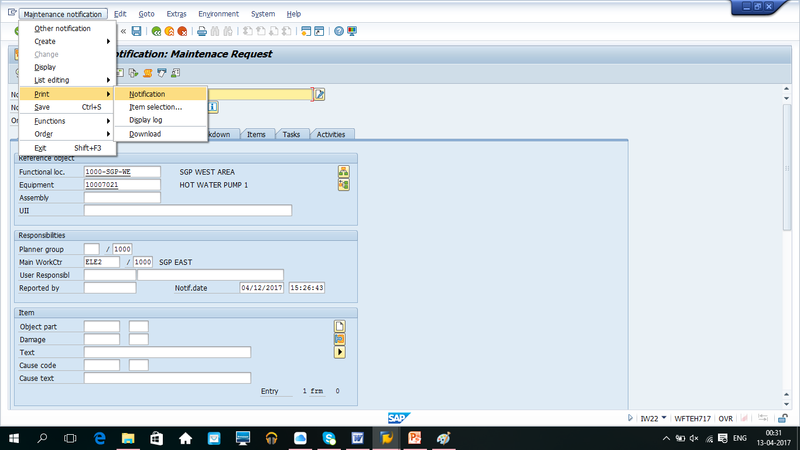 To get the list of notifications, start the transaction IW28 and input the required selection criteria. Use different selection criteria to get the details, e.g date range, status, equipment, functional locations, start date, etc. 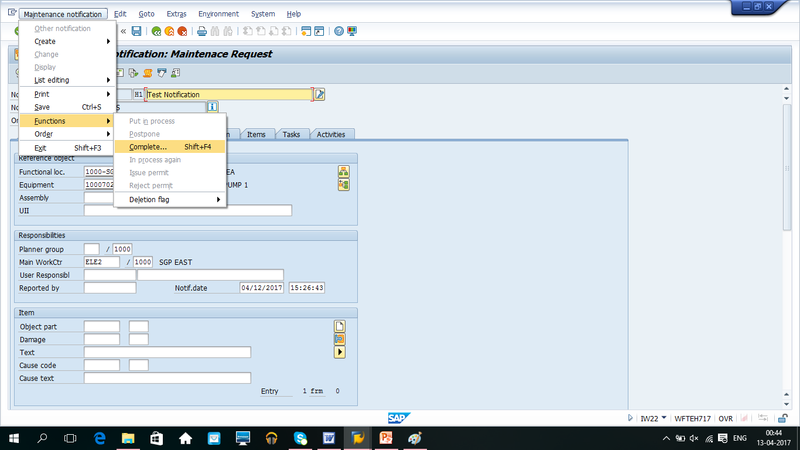 and click Execute (F8) button to receive the output. 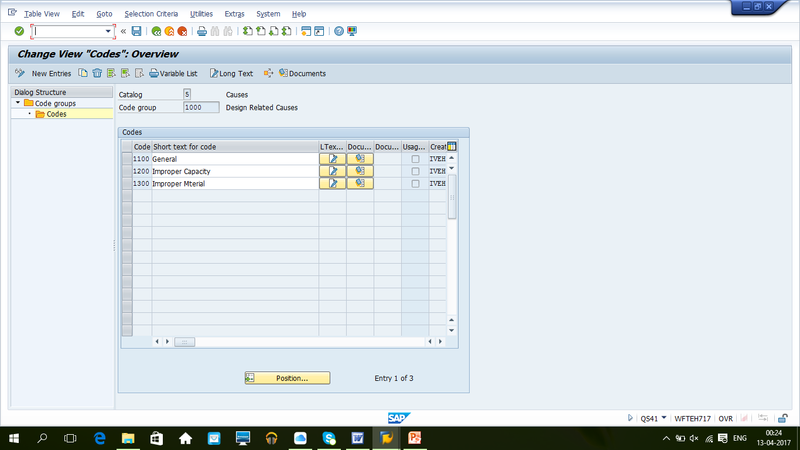 Select a notification from the list and click button to create SAP PM order. It will redirect you to the create order screen which will have a reference to the notification. 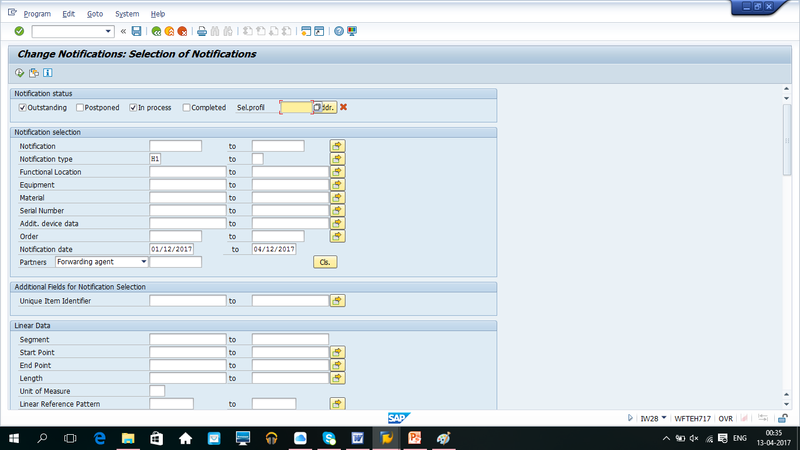 SAP PM Order will follow same process as defined in other tutorials. 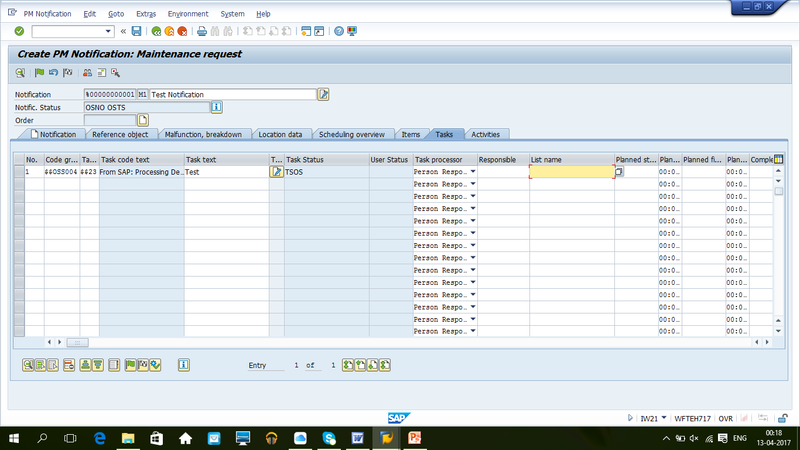 The notification will also contain SAP PM order reference and the status ORAS will also be assigned to it. There are also other transaction which can show list of open tasks (transaction IW66) and items (transaction IW68) in SAP PM notifications. Once maintenance activities are completed, a notification should be closed with details of tasks performed, causes, damage details, breakdown duration and other miscellaneous details. 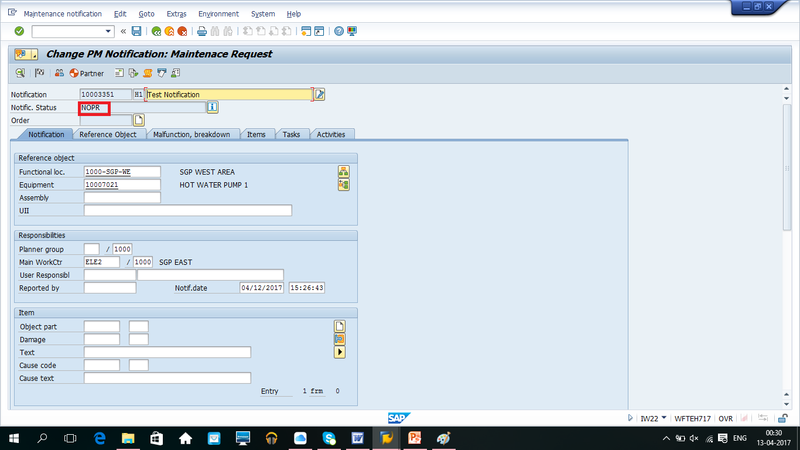 Completion can be done using the same transaction code IW22 which is used for changing a notification. 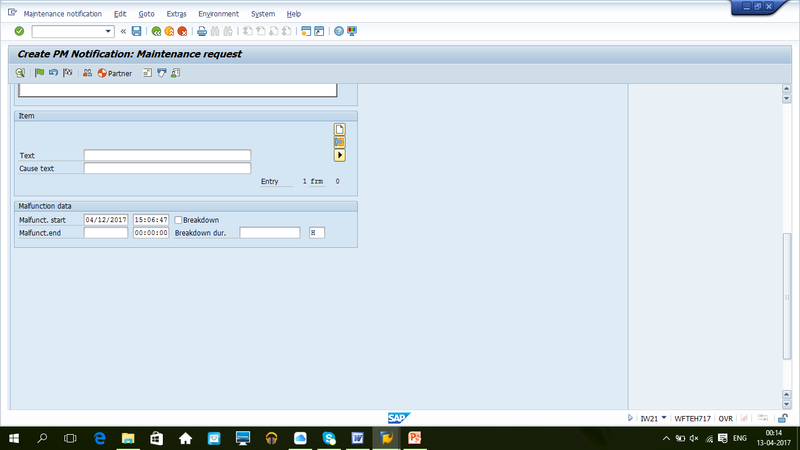 Notification can also be completed along with the technical completion (TECO) of SAP PM orders. You can choose the required action through the top menu as shown below. You can choose date and time for notification completion. It will set the status as NOCO in the notification header. It is not allowed to modify fields once the status is NOCO. Once a notification is set to NOCO, fields are no longer allowed for modification. However, it is possible to revoke completion and set notification again to “In progress” state. You can do this through the top menu: PM Notification>>Functions>>In progress again. Once all the activities related to a notification are done, it is recommended to set a deletion flag. It will set DLFL status to the header. You can do this through the top menu: PM Notification>>Functions>>Deletion Flag>>Set. Did you like this tutorial? Have any questions or comments? We would love to hear your feedback in the comments section below. It’d be a big help for us, and hopefully it’s something we can address for you in improvement of our free SAP PM tutorials. Awesome and very useful documentation. Why doesn’t my Notification page have a Task tab – can I do anything to add it? My screen only shows Notification, Location data, Scheduling overview, Items and Activities tabs. Is there any other way to attach a task to a notification? 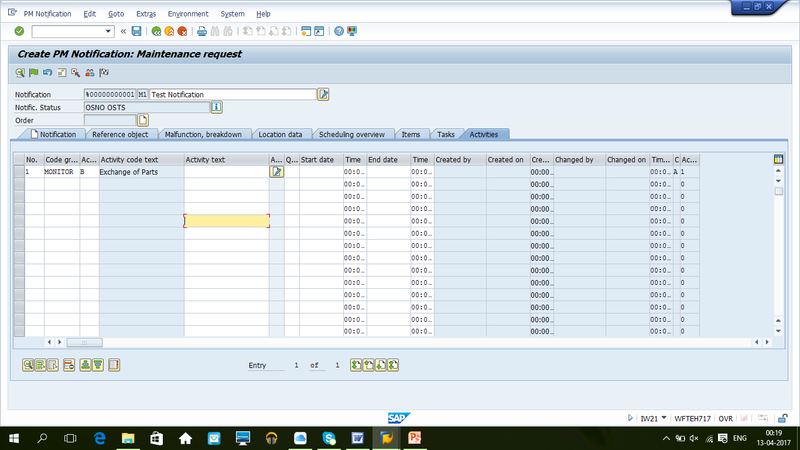 This is defined by Notification Type in customizing for Plant Maintenance (transaction SPRO). Notification Type “H1” that is discussed in this tutorial as an example has Tasks tab. Other Notification Types might have different configuration and don’t include Tasks tab. Is there a way to setup an email notification when a work notification/order is completed? I have the same question as Rob, is it possible to get email notification if maintance of a machine is sheduled, but not done? Is there percentage for pending notifications (not converted to work order) during KPI analysis? I would like perform a mass notification closure ,I have about 453 OPN notifications which were raised back in 2014 & 2016.